The Oder ( /ˈoʊdər/ ; Czech, Lower Sorbian and Polish : Odra, German : Oder, Upper Sorbian: Wódra)  is a river in Central Europe and Poland's third-longest river after the Vistula and Warta. 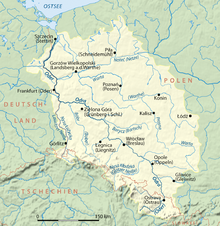 It rises in the Czech Republic and flows 742 kilometres (461 mi) through western Poland, later forming 187 kilometres (116 mi) of the border between Poland and Germany as part of the Oder–Neisse line. 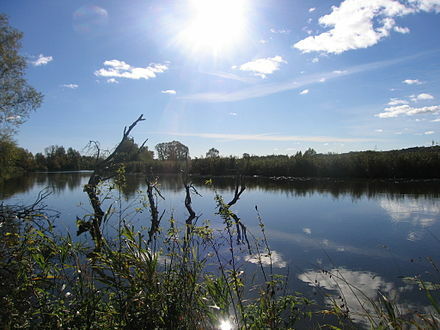 The river ultimately flows into the Szczecin Lagoon north of Szczecin and then into three branches (the Dziwna, Świna and Peene) that empty into the Bay of Pomerania of the Baltic Sea. 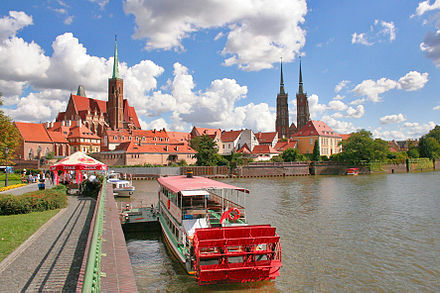 The Oder is known by several names in different languages, but the modern ones are very similar: English and German: Oder; Czech, Polish, and Lower Sorbian : Odra, Upper Sorbian : Wódra; Kashubian : Òdra (pronounced [ˈwɛdra] ); Medieval Latin: Od(d)era; Renaissance Latin: Viadrus (invented in 1534). Ptolemy knew the modern Oder as the Συήβος (Suebos; Latin Suevus), a name apparently derived from the Suebi, a Germanic people. While he also refers to an outlet in the area as the Οὐιαδούα Ouiadoua (or Οὐιλδούα Ouildoua; Latin Viadua or Vildua), this was apparently the modern Wieprz, as it was said to be a third of the distance between the Suebos and Vistula. The name Suebos may be preserved in the modern name of the Świna river (German Swine), an outlet from the Szczecin Lagoon to the Baltic. 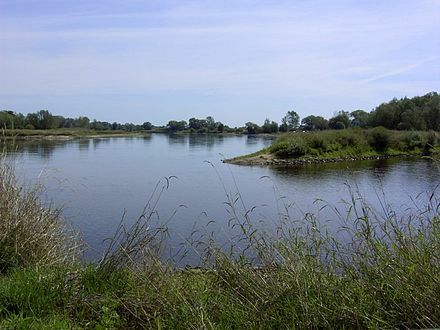 The Oder is 840 kilometres (522 miles) long: 112 km (70 miles) in the Czech Republic, 726 km (451 miles) in Poland (including 187 km (116 miles) on the border between Germany and Poland) and is the third longest river located within Poland (after the Vistula and Warta), however, second longest river overall taking into account its total length, including parts in neighbouring countries. It drains a basin of 119,074 square kilometres (45,975 sq mi), 106,043 km2 (40,943 sq mi) of which are in Poland (89%),  7,246 km2 (2,798 sq mi) in the Czech Republic (6%), and 5,587 km2 (2,157 sq mi) in Germany (5%). 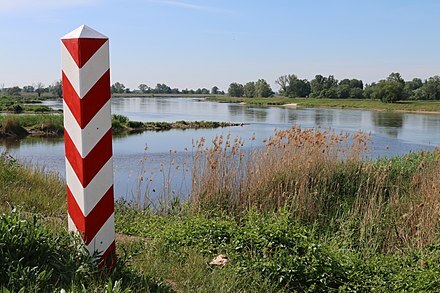 Channels connect it to the Havel, Spree, Vistula system and Kłodnica. It flows through Silesian, Opole, Lower Silesian, Lubusz, and West Pomeranian voivodeships of Poland and the states of Brandenburg and Mecklenburg-Vorpommern in Germany. By the Treaty of Versailles, navigation on the Oder became subject to International Commission of the Oder. Following the articles 363 and 364 of the Treaty Czechoslovakia was entitled to lease in Stettin (now Szczecin) its own section in the harbour, then called Tschechoslowakische Zone im Hafen Stettin. The contract of lease between Czechoslovakia and Germany, and supervised by the United Kingdom, was signed on February 16, 1929, and would end in 2028, however, after 1945 Czechoslovakia did not regain this legal position, de facto abolished in 1938–39. At the 1943 Tehran Conference the allies decided that the new Eastern border of Germany would run along the Oder  but after World War II, the Oder and the Lusatian Neisse formed the Oder–Neisse line, which was designated by the victorious allies at the Potsdam Conference as the new border between Poland and Germany. A significant percentage of the German populations east of these two rivers were evacuated by the Nazis or fled before the approaching Red Army. After the war, the remaining population was forcibly expelled in accordance with the Potsdam Agreement. East Germany confirmed the border with Poland in 1950, then West Germany, after a period of refusal, finally accepted the border in 1970. In 1990 newly reunified Germany and the Republic of Poland signed a treaty recognizing it as their border. Wikimedia Commons has media related to Oder River . ↑ kontakt@naukowiec.org, naukowiec.org. "Największe rzeki w Polsce". Naukowiec.org. Retrieved 13 August 2018. ↑ NoorderSoft Waterways Database Archived November 9, 2005, at the Wayback Machine . ↑ XII. ORDERLY TRANSFER OF GERMAN POPULATIONS. The Three Governments, having considered the question in all its aspects, recognize that the transfer to Germany of German populations, or elements thereof, remaining in Poland, Czechoslovakia and Hungary, will have to be undertaken. They agree that any transfers that take place should be effected in an orderly and humane manner. This article incorporates text from a publication now in the public domain : Chisholm, Hugh, ed. (1911). "Oder". Encyclopædia Britannica . 20 (11th ed.). Cambridge University Press. pp. 2–3.